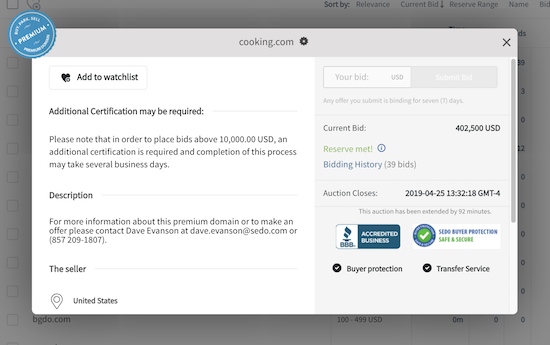 Sedo’s Great Domains auction concluded a few moments ago, and Cooking.com was sold for $402,500. The auction was extended by over and hour and a half as the high bidder continued to slowly increase the high bid enough to hit the reserve price. In total, there were 39 bids placed in the auction. The Indian Domain Summit will be taking place in India on April 27th. The one-day domain investment conference will be held in Amritsar, Punjab at the Golden Sarovar Portico Amritsar. I believe this is the second edition of the Indian Domain Summit. Don’t do business over the phone! Do 99.9% of business via email. Make sure everything that is agreed on is memorialized in an email if u do talk by phone. Do it ASAP & make sure 2 get a confirmation back. Aamir on Joe Biden Running for President, Using JoeBiden.comInteresting to see the website is using Wordpress as the platform. I hope they have it secured properly. Adam on Peter Askew’s Vidalia Onion Story is Inspiring... and he is investing in domains as part of his business strategy. Most companies don’t. Mike on 2nd Annual Indian Domain Summit is This WeekendIf I could close 1% of my indian inquiries I would be a very wealthy man!